Please inform Bed and breakfast Milka in advance of your expected arrival time. You can use the Special Requests box when booking, or contact the property directly with the contact details provided in your confirmation. 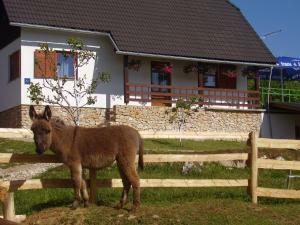 Guest house Milka ~0.1 km, Plitvicka Jezera Please inform Bed and breakfast Milka in advance of your expected arrival time. You can use the Special Requests box when booking, or contact the property directly with the contact details provided in your confirmation. Apartment Goran ~0,2 km, Plitvicka Jezera price per day from € 55 Situated in Plitvička Jezera, Apartment Goran presents self-catering accommodation with gratis wireless internet access. The property is a short walk away from the Spacious Waterfall. The apartment presents a furnished outdoors terrace and a living room with a sofa and satellite television. The kitchen is well-equipped and provides a microwave and a coffee machine. Featuring a bath, the toilet also comes with a hairdryer and free toiletries. Apartment Familie Matovina ~0,3 km, Plitvicka Jezera price per day from € 50 Surrounded by vegetation, Apartment Familie Matovina presents self-catering accommodation situated 4 km from the UNESCO-listed Plitvice Lakes. The accommodation unit is equipped with a flat-screen satellite television and a well-equipped kitchenette. This apartment provides a sofa seating and a private toilet featuring a shower, hairdryer and towels. There is a shared outdoors terrace with dining area. There is a grocery store 300 metres away, while some eating places and clubs can be found 3 km from the Familie Matovina Apartment. Vuković apartment ~0,2 km, Plitvicka Jezera price per day from € 50 Vuković Apartment is set in Plitvice Selo, a short walk away from the Entrance 3 to the Plitvice Lakes National Park. Surrounded by a back yard, it presents apartment with gratis wireless internet access. The apartment will provide you with satellite television and a seating area, as well as with a fitted kitchen. Featuring a shower, private toilet also comes with a hairdryer and free toiletries. The closest dining establishment is 500 metres from the Vuković Apartment. Rastovaca ( ~ 1.7 km ): 33+ accommodation units. Smoljanac ( ~ 4.7 km ): 43+ apartments. Grabovac ( ~ 7 km ): 25+ apartments, 2+ villas, 12+ hotels. Rakovica ( ~ 10.6 km ): 28+ apartments. Rudanovac ( ~ 17.7 km ): 8+ hotels. Slunj ( ~ 21.1 km ): 34+ apartments.